Bony fusion of joints has been the mainstay for management of arthritis in the foot and ankle for many years with cancellous bone from the iliac crest as the graft of choice. Harvest of bone from the iliac crest is a procedure fraught with high cost and morbidity. 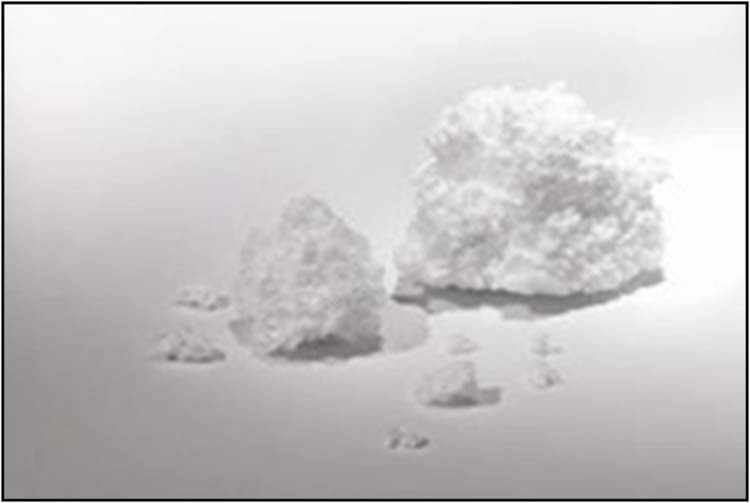 SiCaP is an osteoconductive calcium phosphate ceramic which elicits osteogenic effects primarily due to the site specific substitution of phosphate ions with silicon (0.8% by weight). The primary aim of this study was to review the fusion success rate and clinical outcomes in 24 patients who underwent tibiotalar arthrodesis with a fibular plate technique and SiCaP bone graft substitute. 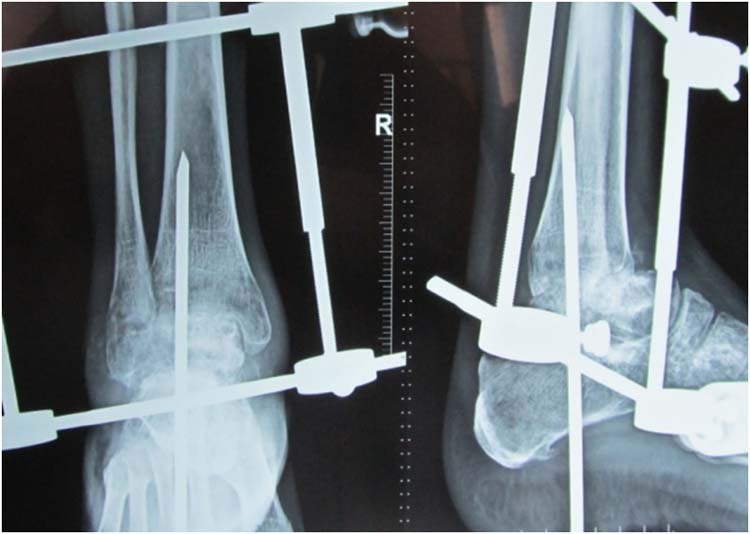 Twenty-four patients underwent ankle arthrodeses performed by one surgeon (GCP) from March 2008 to March 2009. All had the same operative technique using a transfibular ankle arthrodesis with multiple screw fixation and a fibular onlay strut graft. In this series using SiCaP, we were able to obtain a 91% fusion rate and an 86% satisfaction rate with an average improvement of 47 points using the AOFAS score. In conclusion we have demonstrated that SiCaP bone graft substitute to be a viable alternative for fusion in the foot and ankle. Bony fusion of joints has been the mainstay for management of arthritis in the foot and ankle for many years. Until recently, fusion was the only reliable means of surgically treating patients with advanced arthrosis of the ankle joint, as it provided predictable stability and relief of pain. While the resurgence of popularity in total ankle replacement is currently exhibiting promising results, ankle fusion still remains the gold standard for the management of ankle arthritis. Figure 1 Silicated calcium phosphate (gray) integration with the surrounding bone matrix (red). Evidence of graft incorporation at 6 months [Magnification x 520] (a). Evidence of early bone formation at 2 months. [Magnification x 510] (b). North American Spine Society , 7/3, Wheeler, D, Jenis, L, Kovach, M, Marini, J, Turner, S, Efficacy of silicated calcium phosphate graft in posterolateral lumbar fusion in sheep, 308-317, Copyright 2007. (With permission from Elsevier). This significant improvement from the previously cited rates of 40% and 60% for nonunion and complications, respectively is mostly due to the use of rigid internal fixation. Several different constructs have demonstrated valid, reproducible results including the application of external fixation, crossed screws, fixed-angled plates and screws, fibular strut grafting and intramedullary fixation, which sacrifices the subtalar joint. The majority of the data reported used cancellous bone from the iliac crest as the graft of choice. In an attempt to control this expense and reduce complications to the patient, these alternative “off-the-shelf” bone graft substitutes are continually being investigated for their clinical utility as replacement bone graft materials. One such bone graft alternative, SiCaP (Actifuse, Apatech), has been initially tested with success in lumbar posterolateral fusion in sheep. Pre-clinical data from the posterolateral lumbar fusion sites in sheep treated with Actifuse reveal robust graft integration at 2 and 6 months. (Fig. 1) SiCaP is an osteoconductive calcium phosphate ceramic which and elicits osteogenic effects primarily due to the site specific substitution of phosphate ions with silicon (0.8% by weight). The addition of silicon in the form SiO44- has been reported to upregulate osteoblast proliferation and differentiation, promote osteoinductive gene expression and increase Type I collagen synthesis. [10,11] More importantly, clinical data on lumbar fusion with silicate-substituted calcium phosphate (SiCaP) v. ICBG in adults reveals equal or greater healing rates. The osteogenic, osteoconductive, and osteoinductive effect of this ceramic has characteristics suggesting that it may be a reasonable alternative to ICBG. The primary aim of this study was to review the fusion success rate and clinical outcomes in 24 patients who underwent tibiotalar arthrodesis with a fibular plate technique and SiCaP bone graft substitute. 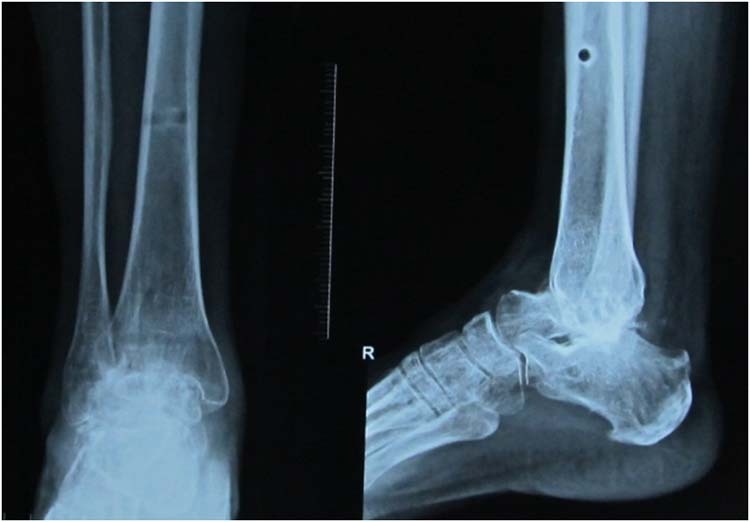 Twenty-four patients underwent ankle arthrodeses performed by one surgeon (GCP) from March 2008 to March 2009. 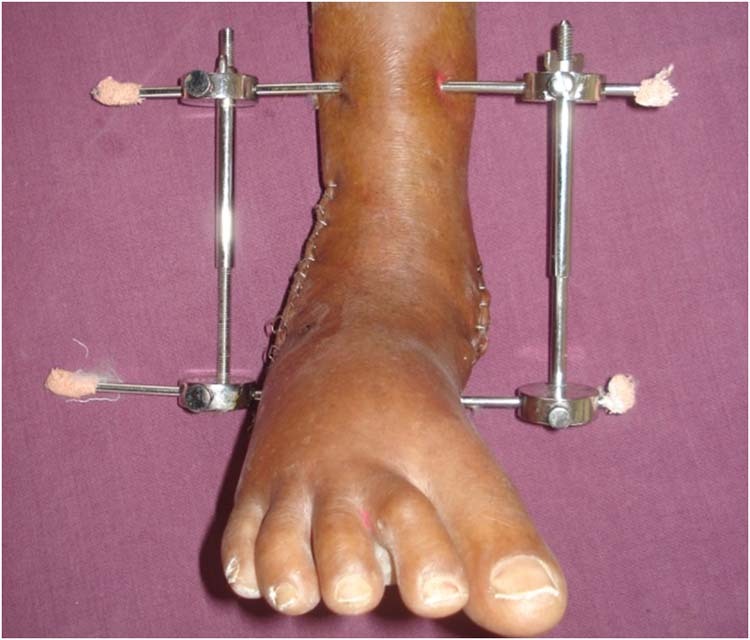 All had the same operative technique using a transfibular ankle arthrodesis with multiple screw fixation and a fibular onlay strut graft. The etiology of their arthritis was traumatic in fourteen patients, previous talar OCD in two patients, and the remaining patients were of insidious onset. 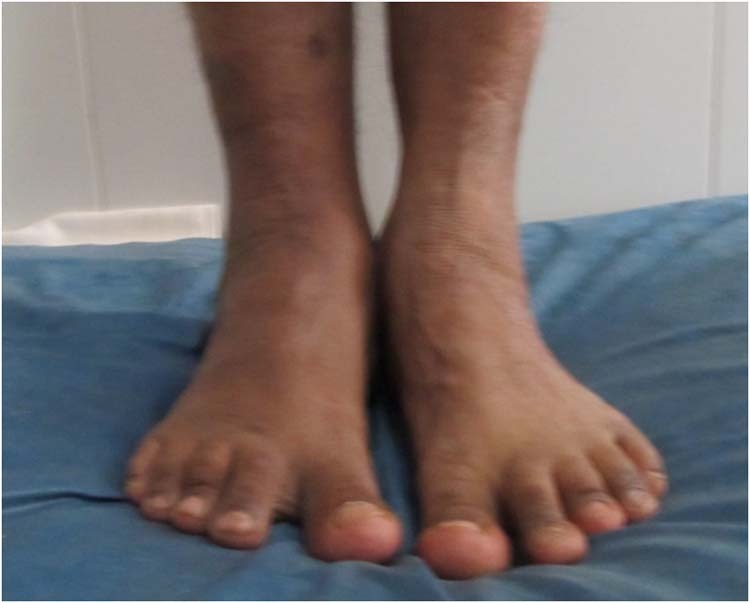 There were six with varus malalignment and six with valgus malalignment, defined as tilt of the talus on standing anterior posterior view of the ankle greater than 3 degrees. Sixteen patients used either a custom AFO or Arizona brace prior to proceeding with ankle fusion. Interval follow-up visits were scheduled at five and eight weeks, three months, and six months. Postoperative standing anteroposterior and lateral radiographs were routinely obtained at two week and eight week visits. Evaluation to determine if the ankle joint was indeed fused was done so radiographically. Time to osseous union was determined by clinical stability and radiographic evidence of bridging bony trabeculae across the tibiotalar space. Once bony healing had occurred, patients were advanced to full weightbearing without protection. The American Orthopaedic Foot and Ankle Society’s (AOFAS) ankle-hindfoot rating scale was applied retrospectively to obtain a preoperative and postoperative score. Statistical comparisons were made using Wilcoxon’s signed-rank test to compare pre- and postoperative values within each individual variable studied. The paired t-test was used to assess the statistical significance of the patients’ preoperative and postoperative AOFAS ankle-hindfoot scale scores. Comparisons were considered statistically significant if p<0.05. The patients were positioned supine with a thigh tourniquet and a bolster under the buttock to allow for exposure of the lateral aspect of the operative ankle. 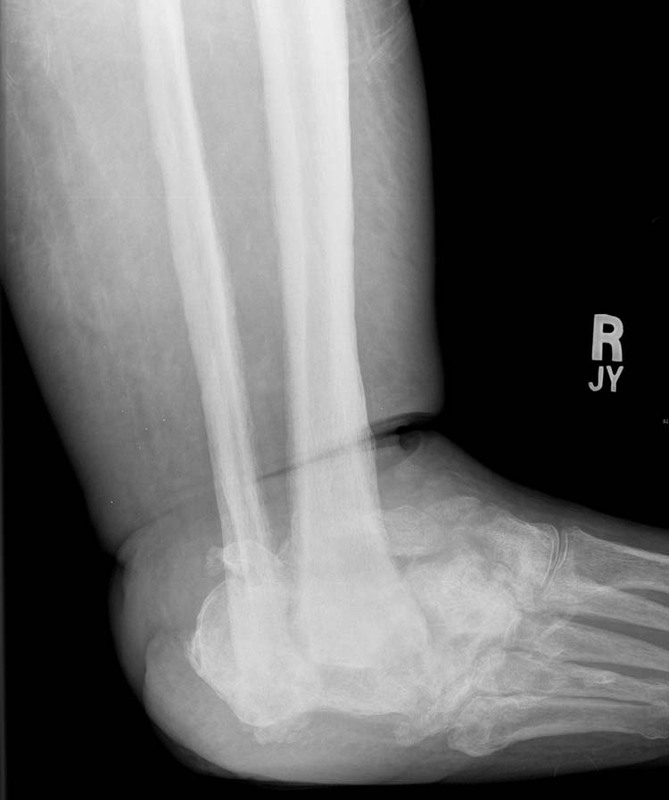 An 8 cm anterolateral incision was used to expose the distal fibula and syndesmosis. 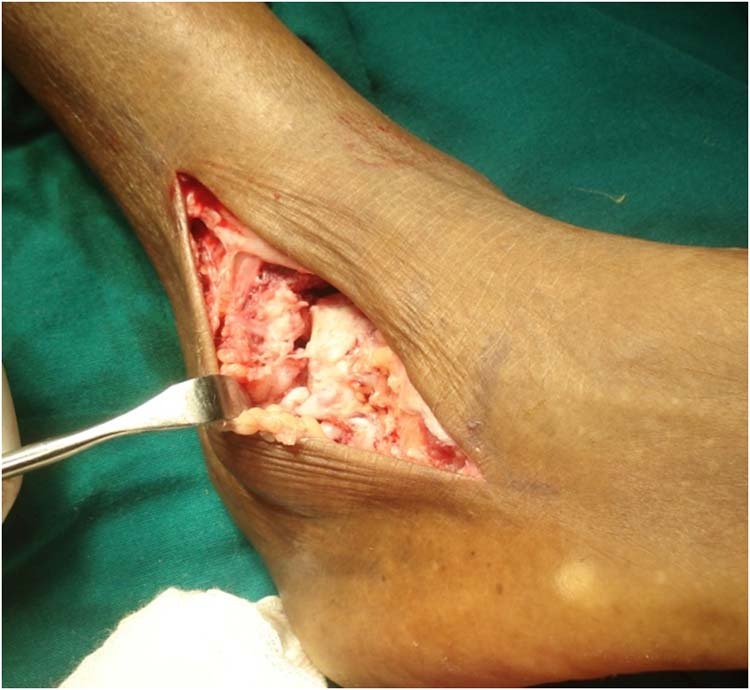 Care was taken to preserve the posterior soft-tissue envelope of the distal fibula. The fibula was transected 6 cm proximal to its distal tip and a 1 cm segment was removed. 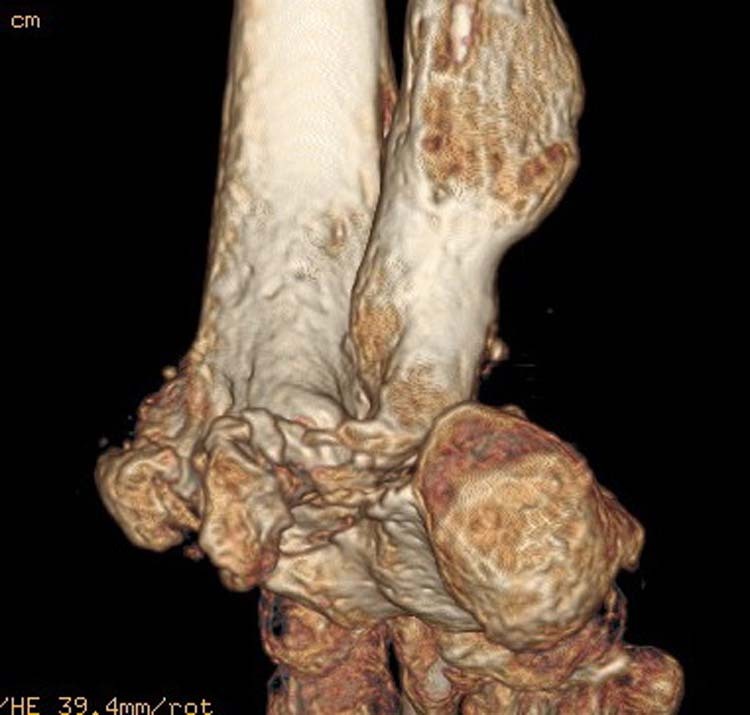 The anterior syndesmosis was sharply debrided, allowing the distal fibula to hinge posteriorly. A small bump was placed under the distal tibia to allow the body of the talus to be translated posteriorly onto the tibia. If there was an anterior tibial spur, it was removed with a curved osteotome. The tibiotalar joint was then distracted with lamina spreaders and denuded of articular cartilage. The tibiotalar joint and lateral tibia and talus were denuded of cartilage with osteotomes and curettes. A separate medial incision of 4 cm was made just medial to the tibialis anterior tendon as it crossed the ankle joint. The tendon and neurovascular bundle were retracted laterally. The medial gutter was exposed, anterior osteophytes removed, and the medial aspect of the tibiotalar joint was denuded of residual articular cartilage. Multiple subchondral perforations into the tibial plafond, talus, and syndesmosis, were created with a 2 mm drill bit to improve vascular ingrowth. If the bony deformity prevented proper alignment, an osteotome was used to plane the joint. The distal fibula was split in half in the sagittal plane. The medial half of the distal fibula was excised. The transverse osteotomy was performed first to avoid breaking the fibular strut while denuding the syndesmosis. If at this time the ankle could not be reduced to a neutral position in the sagittal plane, a percutaneous Achilles tendon lengthening was conducted. Depending on the size of the patient, the contents of a 1.5 or 2.5 cc vial of SiCaP granules. (Fig. 2) were packed into both the tibiotalar and distal tibiofibular joints via both incisions. Figure 3 Pre-operative anterior posterior and lateral images before ankle arthrodesis. The tibiotalar joint was then manually reduced and maintained in neutral while three partially threaded 6.5 mm screws were placed in compression after recessing the screw heads were recessed with a burr. Anteroposterior and lateral views of the ankle and a Harris view of the subtalar joint were obtained to confirm adequate reduction of the tibiotalar joint, proper ankle alignment, and absence of penetration of the subtalar joint with the fixation devices. Once acceptable fixation was achieved, the lateral half of the distal fibula was placed across the ankle joint with the cancellous surface against the prepared tibia and talus. 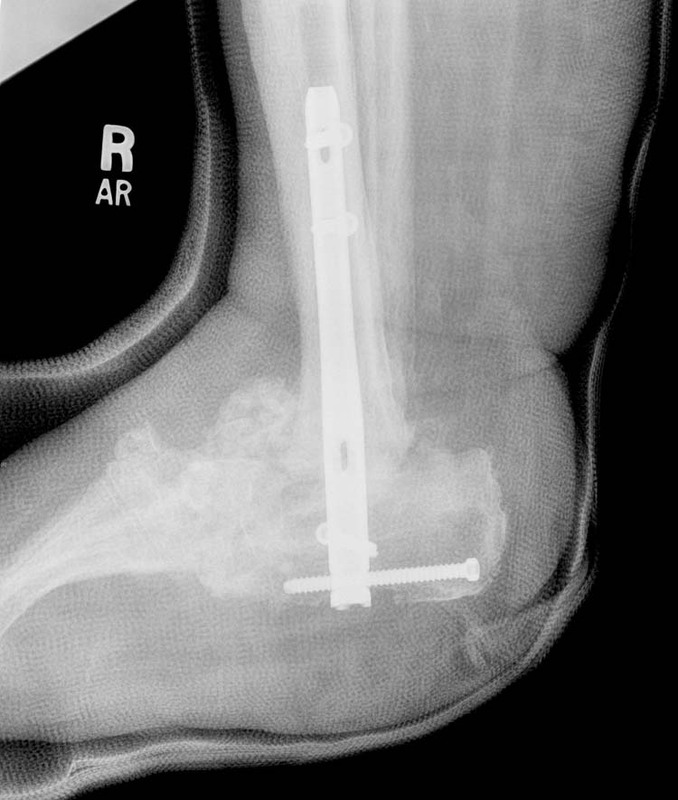 The fibular strut was then maintained reduced with a large pelvic reduction clamp while it was secured in compression with a 4.5 mm screw proximally into the tibia and a 6.5 mm screw distally into the talus. If any further procedures were completed, they were initiated at this time. Otherwise, the wounds were gently irrigated and closed with interrupted 3-0 monocryl suture and the skin was approximated with staples. The ankle was then immobilized in an accommodative splint. 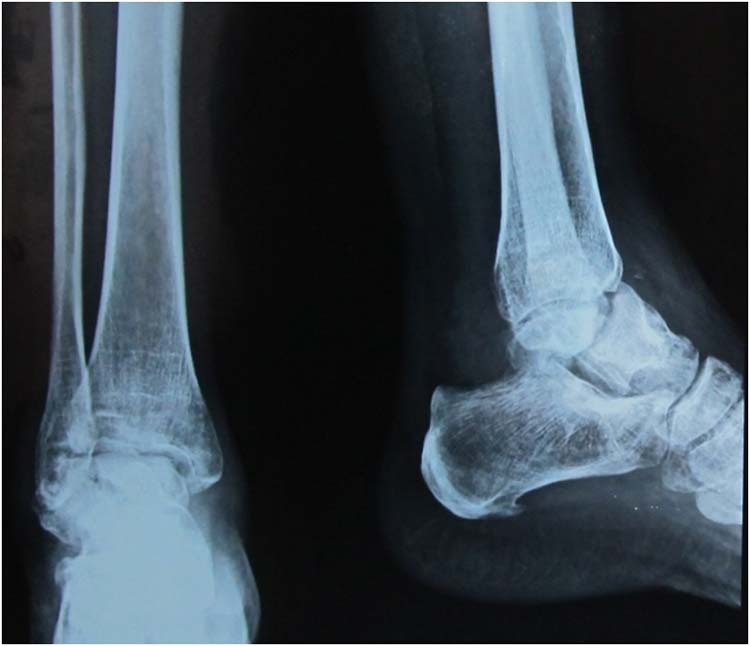 Figure 4 Post-operative anterior posterior and lateral images after successful ankle arthrodesis. Postoperative instructions included strict non-weight bearing and elevation for eight weeks. 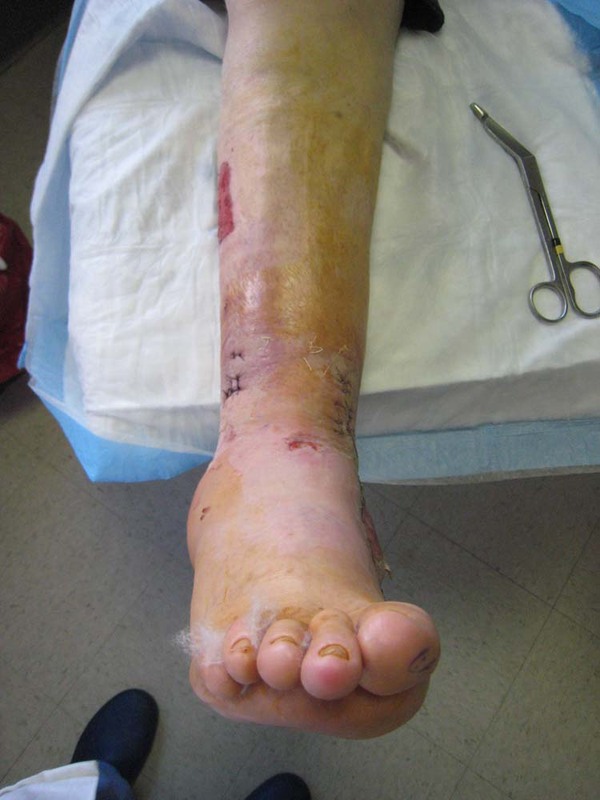 After the postoperative splint and staples were removed at two weeks, patients were placed in a fiberglass cast for a total of eight weeks of immobilization. Full weight-bearing in a shoe was initiated at eight weeks, unless there was clinical or radiographic evidence of delayed union. Patients not radiographically healed by eight weeks were allowed to weight bear as tolerated in a walking cast boot. Radiographs for all patients were available at three months to evaluate the fusion site. Twenty-two of the 24 patients had radiographic evidence of union (91.6%). The average time to union was 71.4 days (range of 60-180 days). 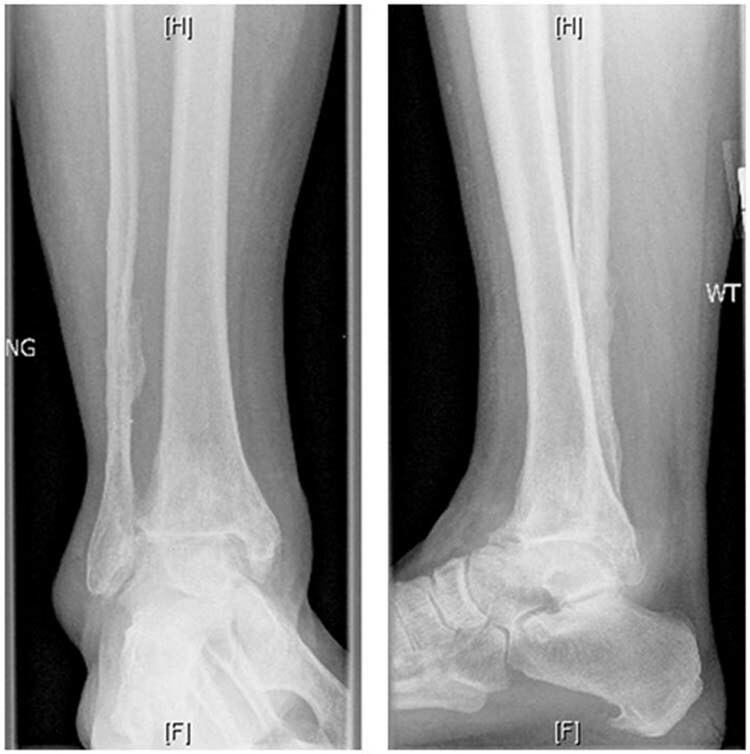 Two patients were lost to follow up for their one year AOFAS score, however, both patients for whom complete records were not available did have postoperative radiographs verifying bony healing. Of the 22 patients with completed postoperative data, the average age was 56 years (24-79). The average follow-up was 22 months (14-26 months). The 22 patients who were evaluated with an AOFAS score had an average improvement from 35 to 82 points (p<0.002). One patient reported to continuing smoking during their recovery. Five patients of the study group were being treated for diabetes mellitus. Four patients received perioperative immunosuppressants, one due to their solid organ transplant, two for their rheumatoid disease and one for myelodysplasia. Four patients were chronically on narcotic analgesics immediately prior to surgery. 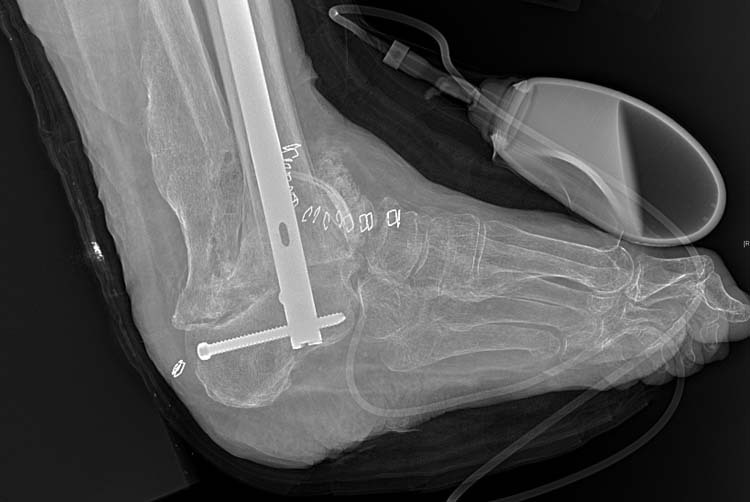 One patient was a revision ankle fusion who underwent a concomitant subtalar fusion. Two patients had first metatarsal dorsiflexion osteotomies with peroneus longus to brevis transfers for forefoot driven hindfoot varus and one patient had a concomitant joint sparing flatfoot reconstruction. 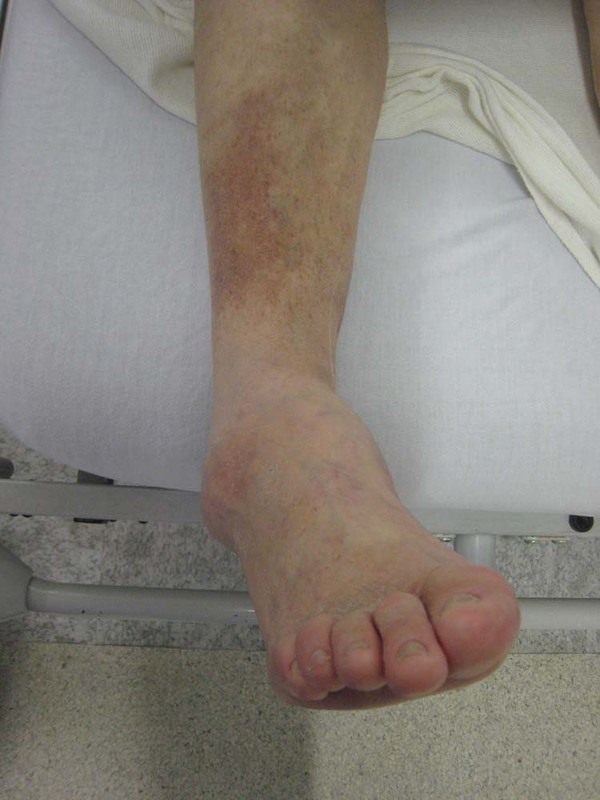 One patient who did not heal his arthrodesis was on chronic immunosuppressants and was receiving supplementary dialysis at home for a failing renal transplant. A second patient had the fusion site collapse into valgus and required an Arizona brace for ambulation in the community. He had no significant medical comorbidities, but did have a rigid subtalar joint upon examination preoperatively. On review of his radiographs, his medial gutter was lagging in mineralization at two months when he was released to full, unprotected weight bearing. Four patients had a superficial wound dehiscence that resolved with wound care and limited oral antibiotics. Nineteen of the 22 patients available for follow-up AOFAS scores at one year were very satisfied (86%). Of the three patients with persistent pain and disability, all three were on chronic narcotics preoperatively. One of these was the nonunion which had collapsed into valgus. Concomitant procedures were completed in five patients. One patient who was undergoing a revision ankle fusion also had a subtalar fusion with screws at the same time. SiCaP granules were used as the graft at that level as well. One patient had hardware removed that was previously placed to treat her ankle fracture. One patient had a flat foot reconstruction as previously described by Pomeroy et al. and two had concomitant cavovarus reconstructions. Interestingly, the two patients with the lowest postoperative AOFAS scores were these two patients. 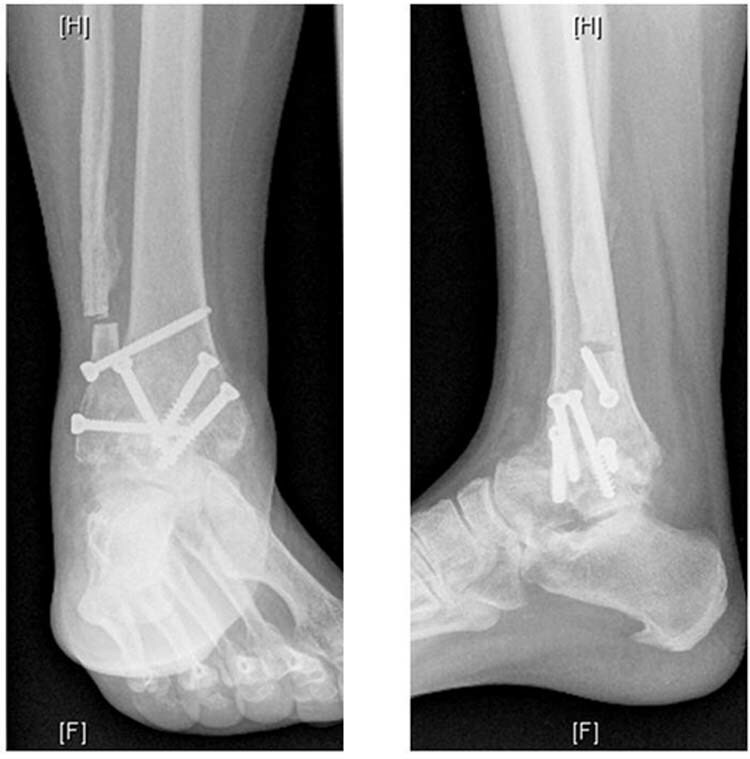 At six months, two patients presented with persistent pain at the lateral screws and about the fibula. They both underwent removal of the distal fibula with screw removal from the lateral side only and resolution of their symptoms. Currently, there is estimated to be one million bone graft procedures performed annually in the United States and Europe. In these procedures, harvesting of autogenous bone graft is predominantly from the iliac crest but also includes local sources such as the tibia and calcaneus, which carry significant morbidity and cost. Identification of a substitute synthetic material with similar structural characteristics as native bone material remains elusive. Demineralized bone matrix (DBM) and bone mineral proteins (BMP) are known to be osteoinductive. They are limited, however, by the variability in their production, carrier, and purity. They are not osteoconductive unless loaded onto a carrier with a three-dimensional calcium based scaffold. While both calcium phosphate and calcium sulfate preparations are osteoconductive, the carbonated hydroxyapatite that forms on the surface of the biomaterial has been shown to be osteoinductive. In particular, it is able to recruit stem cells and promote growth factors. CaP biomaterials have a surface geometry that when placed in a living bone microenvironment allows for adsorption of endogenous BMPs, but this is also dependent on the pore size of the material. Silicated calcium phosphate has several unique features differentiating it from other bone graft substitutes. The site-specific silicate substitution gives SiCaP osteogenic properties as well. In-vitro data collected from tissue-culture studies with osteoblast-like cells reveals that silicon ions may leech out of the graft material into the surrounding bony microenvironment. Silicon ions have been reported to increase osteoblast production of Type I collagen as well as to upregulate production of amelogenin and enamelin that are precursors to osteogenesis in teeth. It has also been reported that silicon in the extracellular matrix of bone can lead to upregulation of osteoblast proliferation and differentiation. [20,21] By affecting control over bone scaffold physio-chemistry and microstructure, it is proposed that this bone graft substitute can produce effects similar to autogenously transplanted material. This notion is supported by the increased activity of human SaOS-2 cells in culture in the presence of silicate substituted hydroxyapatite. It also has a profoundly greater osteoconductive effect compared to biomaterials that do not contain silicon. In pre-clinical studies using the distal femurs of rabbits that had been implanted with cylinders impregnated with silicate-substituted hydroxyapatite, there was a significant difference in the location and amount of bone formed. Silicate-substituted hydroxyapatite cylinders had significantly increased new bone formation into the slots of the device when compared to non-substituted hydroxyapatite. In vivo data on ovine and human bone supports the early data that the combination of hydroxyapatite and silicon in this material generates an osteogenic effect equal or greater than autogenous bone graft. In one pre-clinical study, posterolateral lumbar fusion was accomplished in an ovine model comparing autograft to silicon-substituted hydroxyapatite. Histomorphometric analysis at 6 months revealed that the fusion mass was greater than and the bony bridging equivalent to the autogenously grafted levels. In a clinical one-year study, the data on transforaminal interbody fusion using silicate-substituted hydroxyapatite revealed a 96% fusion rate as confirmed by CT scan. Other data comparing rhBMP-2, while another class altogether, is the only other shelf product that has fusions equal to ICBG but in the 90% range. A cost analysis of this material compared to ICBG was completed on 102 patients receiving lumbar fusion. In this prospective randomized clinical trial, patients receiving rhBMP-2 had similar clinical outcome scores, fewer complications, and experienced an average cost savings of $2,319 per patient. In this series using SiCaP, we were able to obtain a 91% fusion rate and an 86% satisfaction rate with an average improvement of 47 points using the AOFAS score. Previous literature using this technique and autogenous iliac crest cited a 96% fusion rate and an average improvement of 36 points on the AOFAS score. In conclusion we have demonstrated that SiCaP bone graft substitute to be a viable alternative for fusion in the foot and ankle. While obtaining successful arthrodesis across any joint is a multifactorial process, this product has shown to provide outcomes similar to iliac crest bone graft and should be considered for further clinical investigation. 3. Raikin SM. Arthrodesis of the ankle: arthroscopic, mini-open, and open techniques. Foot Ankle Clin 2003 8: 347-359. 10. Gibson I, Hing K, Revell P, et al. : Enhanced in vivo response to silicate-substituted hydroxyapatite. Key Eng Mater 2002 20: 203–206. 12. Aubin M, Drew J, Eskander M, Lange J, Clinical and radiological fusion rates following TLIF with silicate substituted calcium-phosphate bone graft substitute for the surgical treatment of degenerative lumbar spine disease. Spine: Affiliated Society Meeting Abstracts. (Supplement 2010 Paper Abstracts: 2009 CSRS Meeting Abstracts and Posters) 2010:177. 18. Guth K, Buckland T, Hing KA. Silicon dissolution from mircoporous silicon substituted hydroxyapatite and its effect on osteoblast behavior. Key Engineering Materials 2006 117: 309-311. 23. Gibson IR, Hing KA, Revell PA, Santos JD, Best SM, Bonfield W. Enhanced in vivo response to silicate-substituted hydroxyapatite. Key Engineering Materials 2002 218: 203-206.